Champneys Health Resorts and Day Spas are world famous and equally adored by both men and women. An experience at a Champneys day spa with it's staggering surroundings and wondrous selection of treatments, this experience will invigorate the mind and pamper the body immensely. Experience day spa heaven with a full 9 hour itinerary complete with 3 serene treatments, you will never want to leave Champneys Grange. The much revered Champneys Massage is one of the treatments that sets the standards of unequivocal bliss. Next is the Relaxing Facial, enough to make the most ardent workaholic want to retire there and then. and last but definitely not least, the Thalassotherapy Pool Session is based on ancient remedies that work to sooth the body of everyday aches & pains. Full use of spa and health club facilities. ﻿A delicious buffet lunch and refreshments will be served in the stunning brasserie. Set in a Georgian mansion amongst parklands and with river views, this plush spa hotel is 1.1 miles from Arlesy railway station and 7 miles from the Shuttleworth Collection aeronautical and automotive museum. This gift is valid for 8 months from date of purchase. Please book your experience in advance to avoid disappointment. Not to be used in conjunction with any other offer. Please arrive 15 minutes prior to your experience. You may use the facilities at the spa from 9.30am to 5.30pm. 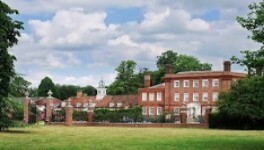 The Champneys Henlow Grange Spa is open seven days per week. This experience is not suitable for spectators. This experience is for one person only.